The mTaxi service is a novel solution developed by Mobitel. It can be accessed by any of our valued customers. When you dial 0710 712 712, your call is forwarded to the nearest available taxi. If the taxi driver does not answer your call, it will then be directed to the next available taxi automatically. Once the call is connected with the taxi driver, the customer can communicate to the driver, the details of the hire. The customer also has the ability to connect to the last dialed taxi even after the initial call is disconnected by following a few simple instructions. Dial 0710 712 712 from your Pre Paid or Post Paid Mobitel phone from anywhere in the country. Listen to the voice guided system and follow the instructions. Confirm your location. Once confirmed, you will be directed to the closest taxi park and an available driver will speak to you to discuss your journey. Once the details of the hire is confirmed, you can provide your exact location to the driver. If you need to contact the taxi driver you spoke to again, the mTaxi service enables you to call back. The system also facilitates you to check your previously used taxi information as well. is a single hotline for taxis in the country. does not require you to remember multiple taxi numbers. does not require you to call multiple taxi services. is a reliable & time saving service. will connect you with a taxi from a taxi park located closest to you. will ensure that your mobile number will not be displayed to the taxi driver. The mTaxi service is designed specifically to connect taxi drivers with customers. 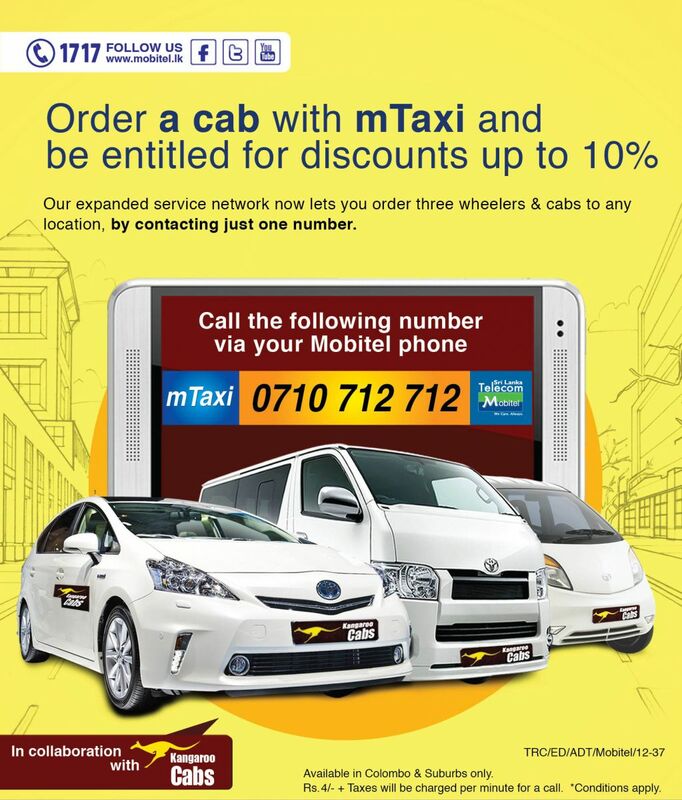 Taxi drivers registered with the mTaxi service will receive calls for hires from mTaxi users. This will help them to enhance their business. How do I register with the mTaxi service? Provide copies of your NIC, driving license and revenue license. Once you submit the necessary documents, you can then obtain a Mobitel - Pre Paid connection free of charge and get registered with the mTaxi service. How will the mTaxi service benefit me? You will have a highernumber of hires. Your number will not be disclosed to the customer and vice versa. Therefore, ensuring the highest levels of privacy. The mTaxi service will offer you free publicity. 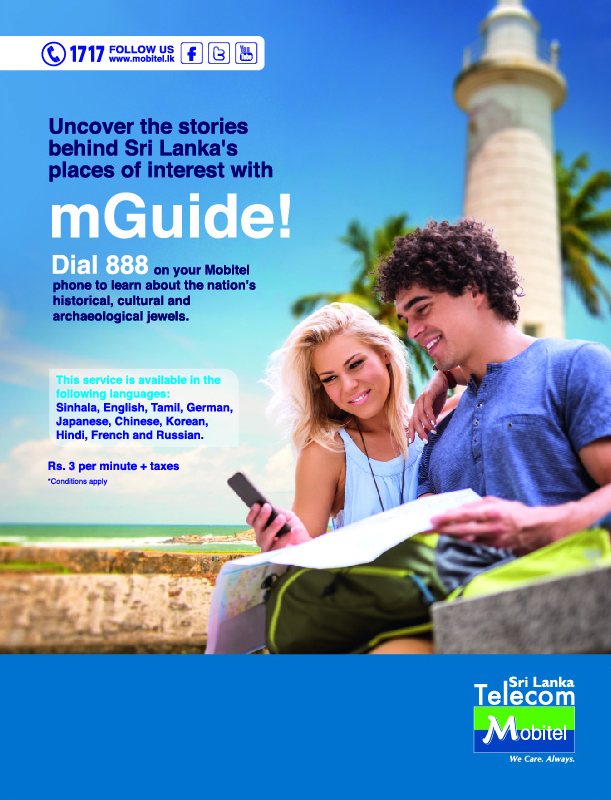 Mobitel mGuide enables you with the ability to explore the true beauty of Sri Lanka, by helping you delve deeper into Sri Lanka's rich cultural heritage and history, giving you more insight into the cultural significance of the most popular historical sites around the country. Explore Sri Lanka from your Mobitel phone. Acquaint yourself with hundreds of sites of cultural/ historical significance and natural beauty, spread across Sri Lanka. Dial 888 to access information about historical sites. Rs. 4 per min + taxes.